Blue Road, Windy Baboulene, Summersdale Travel, 2006 (c2002), ISBN 9781840242348, 320pp. I first read Windy’s book in manuscript, having met the fellow online through the now defunct “studguppies” online writing workshop. For some reason, we had hit it off–likely because he said nice things about my stories, while I couldn’t get enough of his Monty Python-ish humor. And while we stayed connected all these years since, I had nearly forgotten Windy’s book and how funny I had thought it, and what a shame it was that he hadn’t sold it yet. Except he had sold it and it was finally published, nearly ten years later. I had nearly forgotten about it, except that I finally had an opportunity to meet him in the flesh due to a recent trip to Brighton. “Windy, old boy,” I said, “I must beg a copy of your book,” neglecting to mention that I have no idea where that original manuscript copy may have been misplaced in my numerous moves. Being the kind of stand-up guy that he is, he not only presented me one gratis, but he also signed it with his real name and not just some pseudonym foisted off on the less-suspecting. Ten years later, and the book is only better than I remember. First off, the big difference is a title change, to one that is more metaphorical and about the entire book rather than just culled from one of the more hilarious episodes. I suspect there’s been some general word-smithing as well, although my memory isn’t good enough to be able to pin anything exact down. 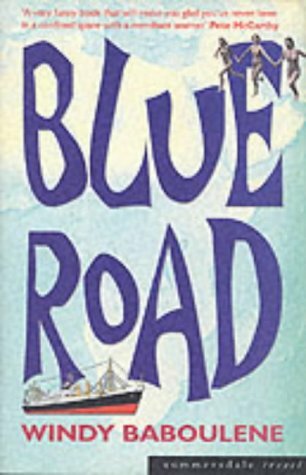 Windy was only seventeen when he felt the call of the open sea–the “blue road.” Of course, it was either that or jail, given his young prolictivities which had recently centered around attempting to burn down the school chemistry lab. The education he was to receive as a merchant marine was much more practical, and likely more suited to his destructive temperament, than the one behind a desk or in front of a chalkboard. He joins the classroom of the confined space where he discovers the amazing properties of coconut oil. Windy undergoes the crossing-the-line ceremony, not for the weak of stomach (and definitely not to be read while eating dinner). And he learns about the love of the sea, and the sea of love, or at least what sometimes passes for that when one is young and apt to ship out on the next tide. Like other British travel writers, Windy has the ability to be both self-effacing and courageous, that ability to keep a stiff-upper lip in times of crises. In a manner similar to Eric Newby, Windy strings the reader along on a story that goes for pages to then quickly be undercut by a single line that reveals the narrator hasn’t got quite the upper-hand he was telling us about. And, like Redmond O’Hanlon, Windy’s travels are the kind that you don’t mind joining in virtually but might think twice about if he rang you on the mobile to join in for a quick jaunt next Tuesday. But mainly, Windy’s funny, and that’s why you need to read this book. Yes, you can learn about the merchant marines, and yes, there’s some bits about places you never heard about before, but the reason you keep reading is because you want that next pain in your side just like the one you got from reading just a few pages back. Not to worry, because Windy’s patter is perfect, just as if you were in the audience for one of the better stand-up comics. I know, you’re thinking, “He’s a friend–you’re just saying these things because you know him.” Ahem. I dare you read this book and not laugh. It really is that good, and deserves to be better known. Now, if he’d just write that second book….